This post is by guest writer Max Iorio. Before the mid-20th century, one of the most popular forms of entertainment in Japan was rakugo, a sort of storytelling performance in which a single performer sits before the audience and tells a tale, which is typically comedic. Though it lost prominence as radio and television became more available to the masses, it still holds a place in Japanese culture and entertainment today. It’s a strong contender for anime of the year. While rakugo is pretty interesting, I didn’t think that it would translate so well as the concept for an anime. However, when Jun Kumagai’s manga series Showa Genroku Rakugo Shinju earned itself an anime adaptation, I was thrilled to be proven so mistaken. 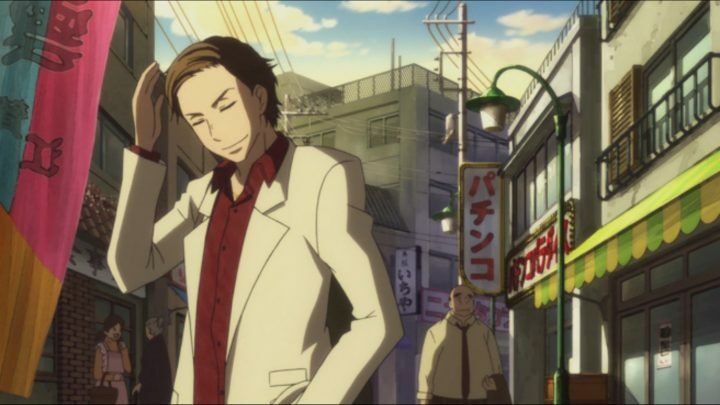 Being aesthetically beautiful throughout can take a series pretty far on its own, but being one of the best-written dramas to air for a while definitely helps solidify Showa Genroku Rakugo Shinju‘s standing as a strong contender for anime of the year. The first episode is an interesting one. Running for twice as long as the other episodes, it introduces us to Yotaro, a man previously associated with a life of crime fresh out of jail looking to start over and pursue a life of performing rakugo. He seeks to become the apprentice of Yurakutei Yakumo (previously named Kikuhiko), one of the most famous rakugo artists in Tokyo. Though he has never taken in an apprentice, Kikuhiko accepts, and Yotaro’s career in rakugo begins. The atmosphere is emotive enough to be a character itself. The first episode also introduces us to some stunning art, which Showa Genroku Rakugo Shinju also proudly displays up until the very last scene. On top of being pure eye candy, the relaxed soundtrack, laden with shamisens, pianos, and wartime jazz, is just as pleasant. This all comes together to create a setting that is so moody and reflective of each scene’s spirit that it’s almost as if the atmosphere is emotive enough to be a character itself. After the initial introductions, the show becomes a retelling of events from Kikuhiko’s past to give context for the circumstances of the show’s present. It begins in Kikuhiko’s childhood in 1930’s Japan, when rakugo is still a popular form of entertainment. 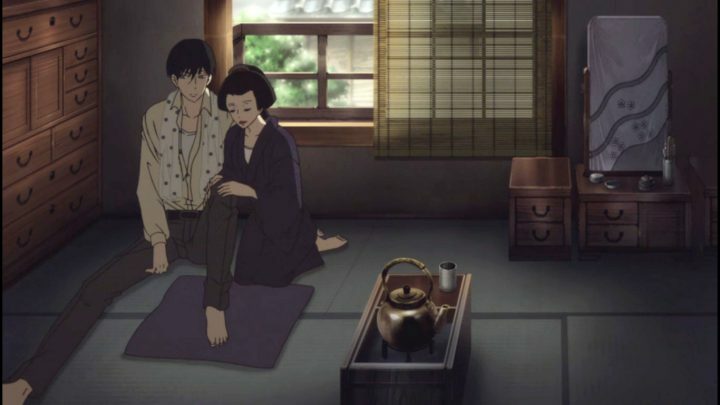 After injuring his leg, Kikuhiko is sent to be an apprentice under a legendary rakugo performer, but as he arrives, another boy named Sukeroku arrives asking to become an apprentice as well. From there, the boys begin to study rakugo together, and the show really starts rolling. From here, we begin to really know our characters. 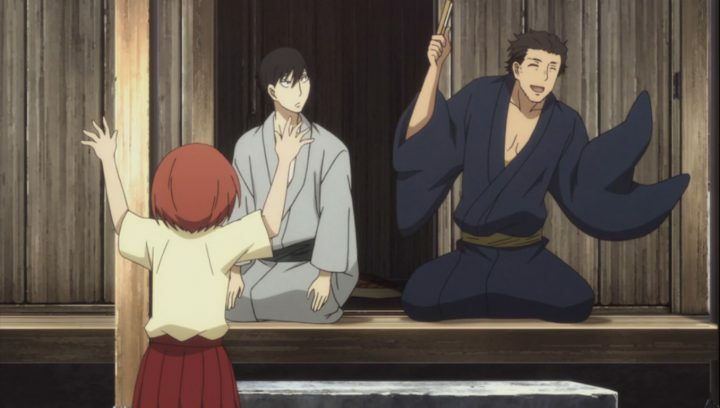 The characters in Showa Genroku Rakugo Shinju are one of the anime’s greatest strengths. All of the characters are believable and individually complex, with genuine motives for each of their actions. As the story progresses, each character reacts to circumstances and events in their own unique ways, and the way everybody’s views conflict with each other’s is brilliant. It makes everything feel that much more believable. Showa Genroku Rakugo Shinju kicks off incredibly well, leaving very little room for improvement. The strong start ensures that what follows is sure to be fantastic, and while it isn’t always near-perfect, it never lets itself become anything less than great. Kikuhiko and Sukeroku are promoted from zenza (the lowest rank in rakugo) to futatsume (the middle rank in rakugo). Along with this rise in rank, Kikuhiko and Sukeroku must move out of their master’s house and live independently. While Kikuhiko works to support himself, Sukeroku chooses to laze around Kikuhiko’s apartment and indulge himself in women and drinking. Sukeroku tries to convince Kikuhiko to loosen up a bit and stop being so uptight, but Kikuhiko is too busy working tirelessly on improving his rakugo to catch up to Sukeroku, whom he is jealous of because rakugo seems to come so naturally to him. In these episodes, things lull a bit — not so much as to bore the viewer, but enough to realize that the show is taking its time to adjust to the new circumstances. Even though things slow down a little, it’s still interesting enough to hold your attention, showing you all of the new developments in each character. Kikuhiko is introduced to his master’s mistress in hopes of raising his spirits, but she falls for him instead. Her love for Kikuhiko takes an ever-changing key role in the story. 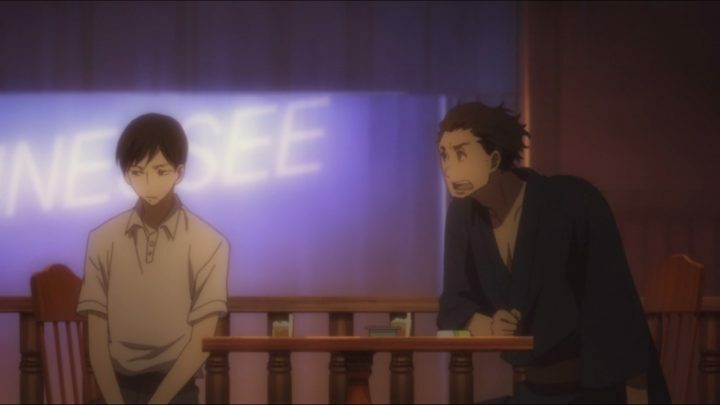 They are two very different people with different goals, and rather than choosing to set up a big happy romance, their relationship is built around the rest of the story, playing alongside and intertwining with the events and exchanges Showa Genroku Rakugo Shinju presents. It’s crazy to see the conflicting emotions they both have for each other as opposed to having a big happy love story premade set out for them. As a climax builds, Showa Genroku Rakugo Shinju goes from very good back to near-perfect. Sukeroku’s arrogance and ego mount as he becomes more and more popular with the audience and he begins arguing with his masters. His outrageous behavior makes it difficult for his master to promote him to shin’uchi (the highest rank in rakugo). But Kikuhiko, on the other hand, has found a style of rakugo that he truly shines in, and his talents, having been fully realized, have now basically guaranteed his position as shin’uchi. The distance between Kikuhiko and Sukeroku only continues to grow larger and larger. The characters’ emotions are clear and really make sense. Conflict ensues, major events take place, and at this point in the story, the characters become more fleshed out and realized than ever before. Though the characters have all displayed multifaceted personalities previously, the variety of conflicted feelings they have when everybody is separated is displayed realistically. I feel like this works so well because Showa Genroku Rakugo Shinju doesn’t just make the emotions so clear, but it also makes the way each character feels make sense. You can understand everybody’s motives when everybody wants to take different actions because everybody’s decisions aren’t only logically comprehensible, but their actions tie in so well with their pre-established personalities. Everything is so beautifully implemented in such a non-confusing way. Showa Genroku Rakugo Shinju‘s characters are all clearly fully realized by both the creators and the audience. 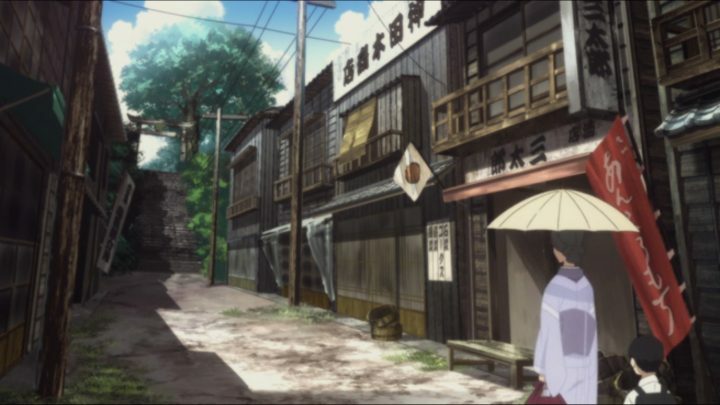 Heavy conflict within the Rakugo Association causes Sukeroku to flee Tokyo in favor of the countryside. Kikuhiko, feeling truly alone, decides that what he has to do is pursue Sukeroku. Closing the show off is a series of episodes that are quite different from previous episodes, but not a whole lot worse. 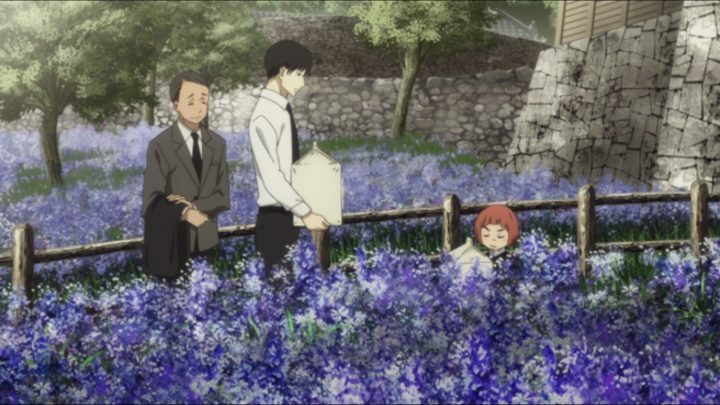 Kikuhiko finds Sukeroku in the country with his daughter. His wife had recently abandoned the family to be with another man and Sukeroku had given up rakugo completely, so things weren’t going all that well for him. Kikuhiko, however, inspires him to use rakugo to pick himself back up again. The ending, while not perfect, is very solid. It all gives exposition to what was set up in the first episode, explaining how things became the way they were. While it isn’t exactly a perfect ending, it’s a great one, and it all builds a great setup for a confirmed second season. As a whole, Showa Genroku Rakugo Shinju is one of the best character-led dramas I have seen in a long while. It boasts some of the most complex and believable characters I’ve ever seen, and despite being a bit of an unlikely concept for an anime, it is brilliantly executed. It will undoubtedly be one of the best shows to come out of 2016.